monoecious, in spikes, showy. Fruit, nuts in spiny burs. 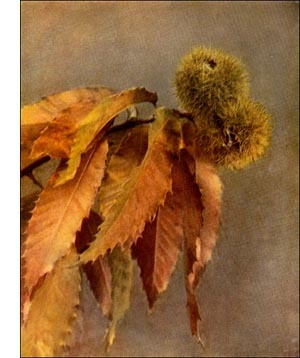 There are five known species of the true chestnuts, three of which are American. One of these is a shrub, C. alnifolia, Nutt. The European species (C. sativa, Mill.) is the well-known sweet chestnut of Italy and Spain, as important in the diet of the peasantry as are potatoes in Ireland. This species extends its range to Eastern Asia. The Japanese C. crenata, Sieb. & Zucc., has been introduced into American gardens. The trees begin to bear when very young. The nuts are not sweet like our native chestnuts, but they are good when cooked.